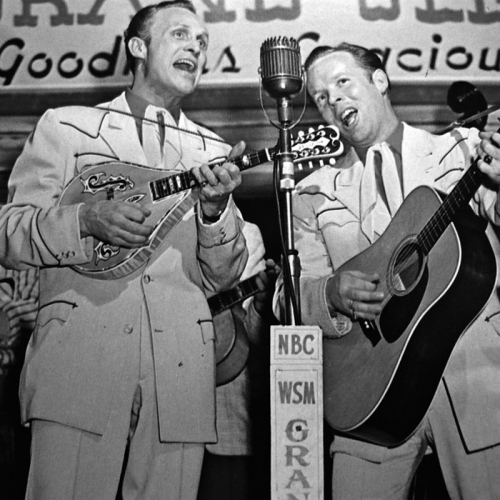 American Routes host Nick Spitzer will participate with The Kitchen Sisters in the Levee Stream local radio project at New Orleans’ Prospect 4. He’ll interview Nesby Phips at 4 PM on Sunday, November 19, about Phips’ efforts to promote his great aunt Mahalia Jackson’s legacy in her hometown. Join us! 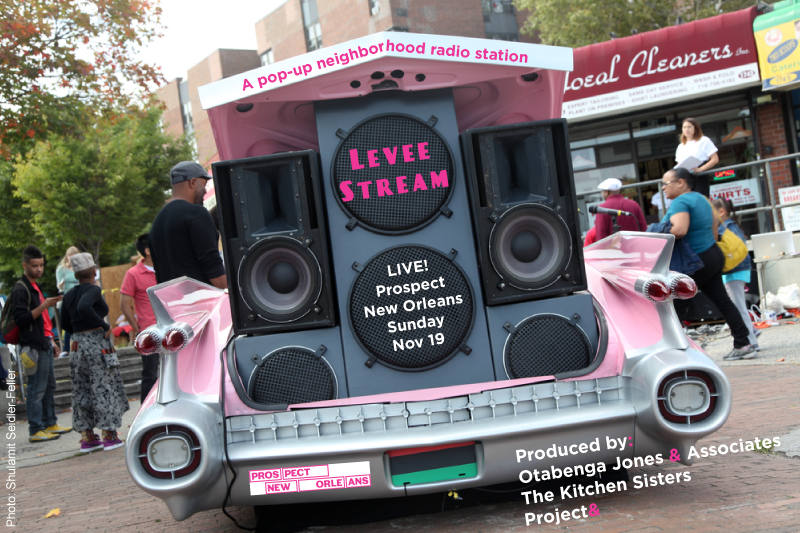 On Sunday afternoon, November 19th, opening weekend of Prospect.4, the legendary Houston arts collective, Otabenga Jones & Associates, Peabody Award winning NPR producers, The Kitchen Sisters and the acclaimed activist arts organization Project& come together on Bayou Road to present Levee Stream a day-long, street-corner, pop-up, Cadillac radio station-installation. Part block party, part soapbox, Levee Stream is broadcasting live from noon till five from a 1959 Cadillac Coup de Ville — a lively mix of conversation and interviews with an array of international artists in town for Prospect.4, Bayou Road neighborhood regulars, entrepreneurs and visionaries, New Orleans artists and activists, live music, DJs, and a five hour “sonic prayer flag” that will unfurl across the afternoon and the neighborhood full of New Orleans voices, shards of sound and archival audio. Come join this live five-hour afternoon event with NPR’s Kitchen Sisters and Otabenga Jones hosted by singer, bandleader, WWOZ DJ and arts activist, Cole Williams. Three DJs will be spinning across the day — New Orleans’ DJ RqAway (The People’s DJ), Matt Knowles of Domino Sound Record Shack, and Houston DJ, collector and ethnomusicologist, DJ Flash Gordon Parks. A few of the Prospect artists coming to be interviewed at the Cadillac include Hank Willis Thomas, John Akomfrah, Xaviera Simmons, Kiluanji Kia Henda, Monique Verdin, Donna Conlon & Jonathan Harker, Cauleen Smith, Jeff Whetstone, Penny Siopis, and Odili Donald Odita. Gia Hamilton and artists from The Joan Mitchell Center will also be heard “on air” at the Caddy. A stunning array of New Orleans artists, activists, chefs, bakers, skateboarders, architects and nuns appearing live in conversation at Levee Stream include: social justice activists, Robert King and Albert Woodfox of the Angola 3, Keith Plessy and Phoebe Ferguson of the Plessy & Ferguson Foundation, the legendary DJ Soul Sister from WWOZ and beyond, Skylar Fein and skaters from Parisite Skate Park, Nick Spitzer of American Routes, Leona Tate of the McDonogh 3, Vera Warren-Williams from Community Book Center, Alon Shaya and many more. Live music will fill the day from long-standing free jazz duo, Alvin Fielder & Kidd Jordan, The Jones Sisters with their deep gospel sound, Cole Williams, “Chicken Violins” from The Homer Plessy School led by Rebecca Crenshaw, Zion Trinity and Joe Krown on Hammond B3. Levee Stream is a day of close listening, unusual encounters, neighborhood revelation and food. Of course food. All kinds of cooking, food and drink will be part of the day from Pagoda Cafe, Coco Hut, The Half Shell, Alon Shaya & Pomegranate Hospitality, Graison Gill & Bellegarde Bakery, Cal Peternell formerly of Chez Panisse, Uncorked, and the New Orleans Ice Cream Company. Meet us on the corner. Hear the stories, voices, visions, issues and music live at the “station.” And record your own story in the tiny shotgun shack on wheels recording booth on the street next to Caddy (built by six high school students from unCommon Construction). Issues of culture, climate, arts, infrastructure, food, family, education and entertainment unfold across the day in an inventive, imaginative, collaborative way. “Levee Stream” is made possible in part by Project& and The Ruth U. Fertel Foundation and McKenna Properties.